Every Trane® system is put through the harshest testing imaginable — all so they can run through anything. And this spring, you can get an unbeatable deal on the most reliable brand of heating and cooling. We never stop finding ways to bring you products that never stop. 0% interest for 60 months or up to $1000 in instant rebate on a new AC system. *See your independent Trane Dealer for complete program eligibility, dates, details and restrictions. 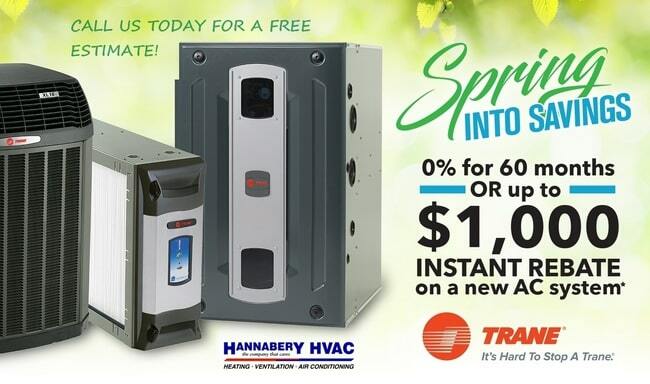 0% interest for 60 months or up to $1000 in instant rebate on a new AC system valid on Qualifying Equipment only. Offers vary by equipment. All sales must be to homeowners in the United States. Void where prohibited. *The Wells Fargo Home Projects credit card is issued by Wells Fargo Bank N.A., an Equal Housing Lender. Special terms apply to qualifying purchases charged with approved credit. The special terms APR will continue to apply until all qualifying purchases are paid in full. The monthly payment for this purchase will be the amount that will pay for the purchase in full in equal payments during the promotional (special terms) period. The APR for Purchases will apply to certain fees such as a late payment fee or if you use the card for other transactions. For new accounts, the APR for Purchases is 28.99%. If you are charged interest in any billing cycle, the minimum interest charge will be $1.00. This information is accurate as of 1/1/2019 and is subject to change. For current information, call us at 1-800-431-5921. Offer expires 5/15/2019. See your independent Trane Dealer for complete program eligibility, dates, details and restrictions. Special financing offers and rebates up to $1000 valid on Qualifying Equipment only. Offers vary by equipment. All sales must be to homeowners in the United States. Void where prohibited. Combine Trane outdoor and indoor components, and you'll create a perfectly matched system that enhances overall performance. There is simply no better way to enjoy total home comfort! Let one of our Trane Comfort Specialists help you choose the right combination of products to fit your comfort needs. Talk to one of our Comfort Specialists for more information! Note: Hannabery HVAC is neither a broker nor a lender. Financing is provided by third-party lenders unaffiliated with Hannabery HVAC, under terms and conditions arranged directly between the customer and such lender, all subject to credit requirements and satisfactory completion of finance documents. Any finance terms advertised are estimates only. Not all buyers may qualify. Higher rates may apply for buyers with lower credit ratings.